Where all can you invest? “Make your money work so you don’t have to work all your life” – you probably hear this a lot. Everybody knows the importance of investing, but do you really know where all can you invest? As one of the popular investment options, equity or stocks is the probably the first investment product you can think of. Issuing shares to the public is one way companies raise money to grow their business. Known to be one of the best investment options, you can either buy shares directly from a stock exchange or indirectly by investing in an equity mutual fund. Every share you buy gives you a tiny stake in the business. Share prices track company performance – they increase when the company does well and decrease when it performs poorly. Invest in companies that you expect to do well and you can profit by selling their shares in later. Who should invest in stocks? Stock prices are sensitive to market developments and don’t guarantee a minimum return or a periodic income. This makes them risky investments. They are an important investment product because they can jack up your portfolio returns. But only invest big sums if you are willing to take the extra risk. Bonds issued by companies and the government are called debt instruments. They are issued for a fixed term and generally pay a periodic interest, called coupon. Unlike shares, bonds do not give you an ownership stake in the issuer. Instead, they make the issuer liable to repay your money and the coupon, as per the promised schedule. This is why bonds are called debt instruments. Who should invest in bonds? Bond returns are more stable and predictable than stocks because bonds are issued for a fixed term and they pay a regular coupon. However, a fixed coupon means that bonds don’t have the growth potential of stocks. Invest in bonds if you are looking for average but stable returns, without taking much risk. These are pools of funds created by fund houses by raising money from investors like you. They are managed by professional fund managers and invested in shares, bonds, and other financial assets. A fund house floats several funds at a time and each of these has a well-defined mandate and objective. For example, a fund may have the mandate of investing only in stocks. Some funds have even narrower mandates, such as investing only in bank or IT stocks. Mutual funds also have specific maturities, payment schedules, and risk levels. 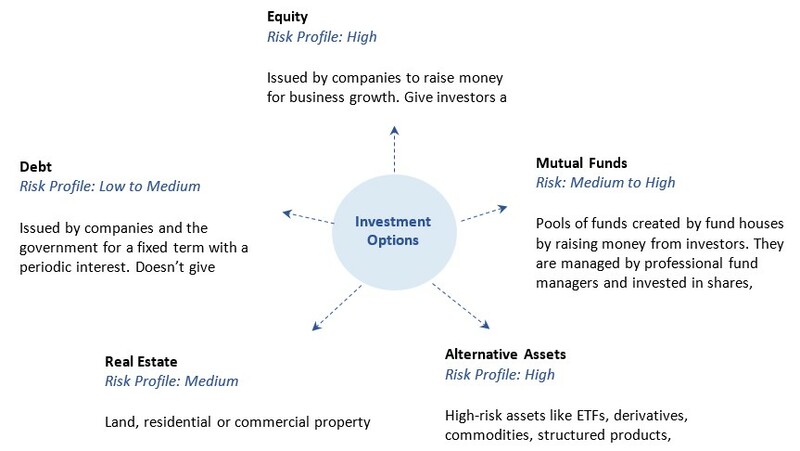 This helps you pick a fund that best suits your requirements. Mutual funds are an excellent investment option if you are new to the market or can’t devote enough time to picking stocks. Since they are managed by investment professionals, they increase your chances of earning good returns. Property is the most favored asset for Indians. Owning land or an additional house gives more satisfaction than other assets because these are tangible. You can quickly sell the property or use it yourself in adversity. In addition, it generates stable and predictable income when you put it on rent. Who should invest in real estate? Real estate investments are ideal for those who are looking for stable, passive returns over the long term. It is also a great option if your investment objective is to secure your children’s future. The only catch is that investing in a house is not as easy as buying a stock. You’ll have to spend much more to buy a house than to buy a stock or a bond. You may even have to take a loan. ETFs, derivatives, commodities, structured products, private equity, and hedge funds are some of the other products you can invest in. These are jointly called alternative assets. They are built on top of assets we discussed earlier and can, therefore, be complex to understand and invest in. Some of these also have a high minimum investment threshold. For these reasons, you need to be careful while investing in these. However, you can generate big returns by investing in these. We will discuss each of these in the detail in later chapters. Who should invest in alternative assets? Alternative assets are a good option if you are looking to diversify your portfolio. Retail investors actively invest in ETFs, commodities, and derivates. Structured products, private equity, and hedge funds are high-risk investments that are popular only among high net worth individuals. You can consider them if you are looking to invest some idle cash and don’t mind losing it if things don’t work out. There are so many good investment options including short term investment options and long term investment options that you probably have a favorite by now. But investing is not only about picking the asset you like the most. To make investing work, you need a well-defined strategy. Build a portfolio that has several assets, in a proportion that is attuned to your unique circumstances and investment objectives.